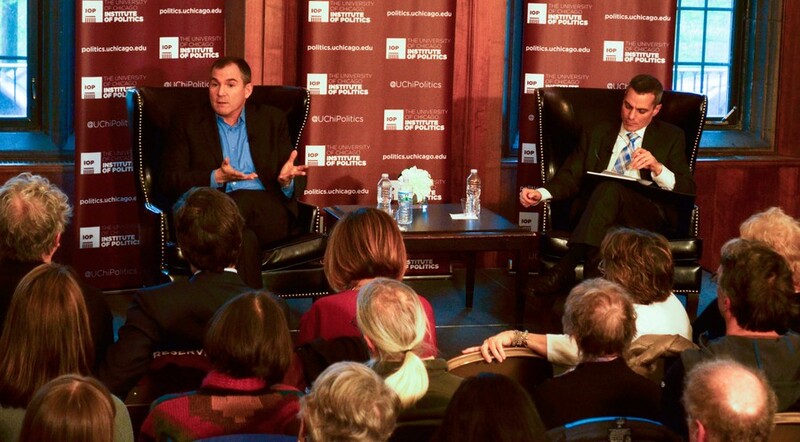 Frank Bruni, an op-ed columnist for The New York Times who has written extensively about Donald Trump and the 2016 election, spoke about the portrayal of Trump in the media at International House on Wednesday night. The conversation, sponsored by the Institute of Politics (IOP), was entitled “Who Created Trump?” and moderated by Jason DeSanto, a senior lecturer at Northwestern University Pritzker School of Law. The event included a discussion between DeSanto and Bruni and a short Q&A session with audience members. DeSanto opened the discussion by asking how Trump’s nomination came about. “[Trump] is singular in a lot of ways,” Bruni responded. He went on to explain how, for many Americans, Congress seems ineffective and corrupt while Trump is an outside force that opposes this system. “People want to hold a match to the [American governmental] system…. They want something destructive,” Bruni said. He said that he believes Trump’s campaign has benefited from the recent atmosphere of disappointment in government. Bruni explained that he believes people are drawn to Trump because they think he talks frankly. “People have conflated vulgarity with direct talk. People are so hungry for direct talk that they are mistaking Trump’s vulgarity for exactly that,” Bruni said. Apart from describing what DeSanto deemed the “Trump phenomenon,” Bruni went on to express his disappointment with the media, especially with respect to this election. He claimed that the news industry has become more “European,” with news now presented from an ideological standpoint rather than an objective one. According to Bruni, this leads to ideological polarization. “Mutual suspicion of political parties is a result of ideological media coverage,” he said. He added that due to modern technology, the news industry is able to calculate what types of news coverage will draw the most attention and that they are using this information to boost their ratings. He criticized the media’s dramatic and suspenseful presentation of the election. “It encourages a reality-show reaction to what’s happening,” he said. While it costs money to do objective reporting, it is far less expensive for news outlets to work from a common pool of information that has already been released, Bruni said. An audience member asked Bruni who he thought would have won the Republican nomination had Trump lost, to which Bruni replied that Marco Rubio would have won the nomination.